Buy Nintendo eShop Card USD 20 for Nintendo eShop on GGlitch.com | Fast, secure and easy! 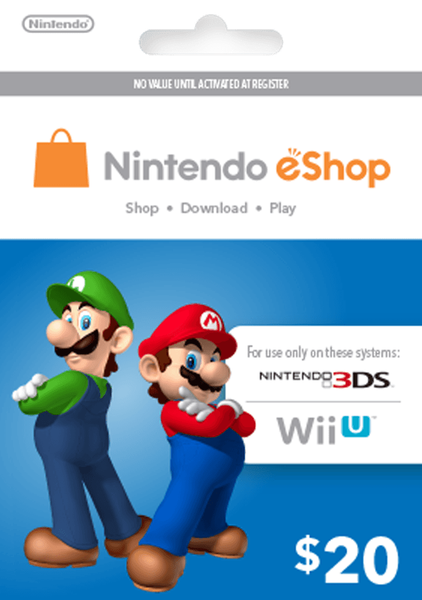 This Nintendo eShop card must be redeemed in an account with currency set to US Dollars. The perfect gift for anyone who loves to play—including you. Choose from over 1,000 new, classic and indie games – delivered directly to your Nintendo Switch, Wii U™ or Nintendo 3DS™ family of systems. Give the gift of fun with the Nintendo eShop Card! It's easy—apply it to your Nintendo eShop account in seconds. It ensures that you’ll always have funds on hand for new games and applications. It’s designed for your Nintendo eShop purchases—no credit card required.